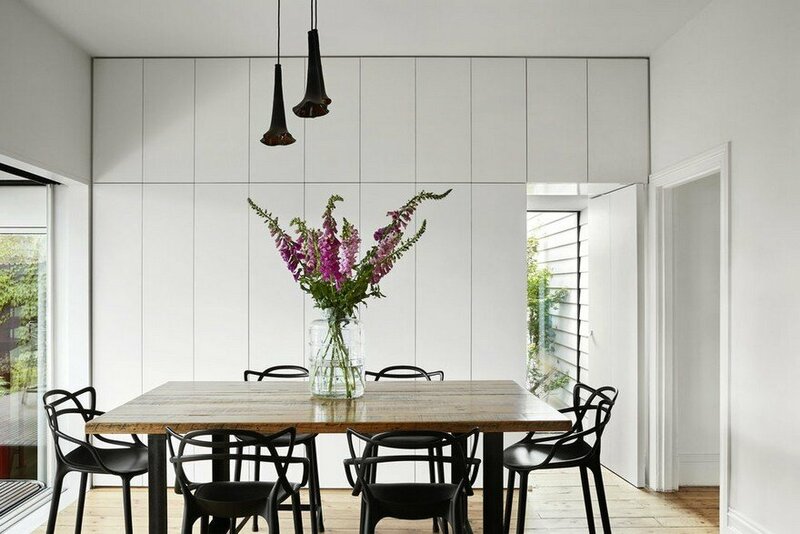 Kiah House is an addition to a weatherboard cottage in North Fitzroy, Melbourne. The extension comprises two separate pieces of architecture, the master bedroom ‘haven’ – which sits beside the original house extending to the northern boundary, and the separate office poised above. The original Victorian-era house, built in 1927, has been respectfully restored and updated with a new kitchen and bathroom. 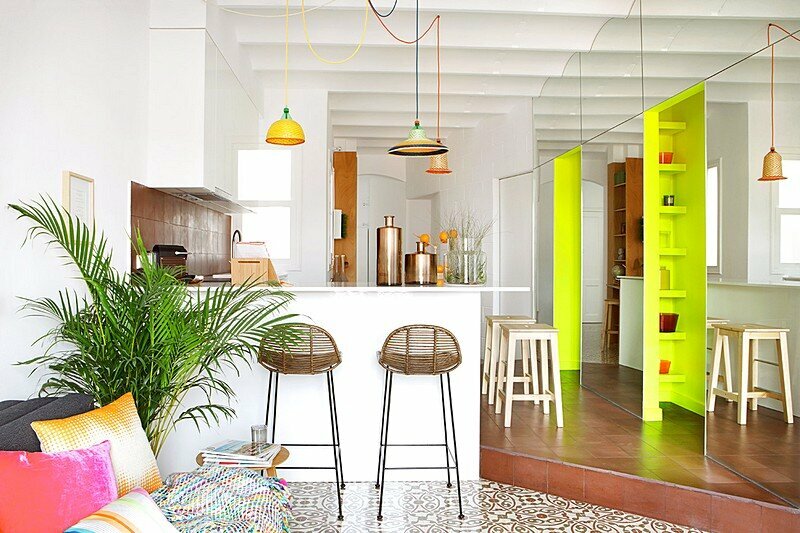 The owners, Angela and Rahul (and their three cats) had a clear idea of what a home meant to them – “a sanctuary”. 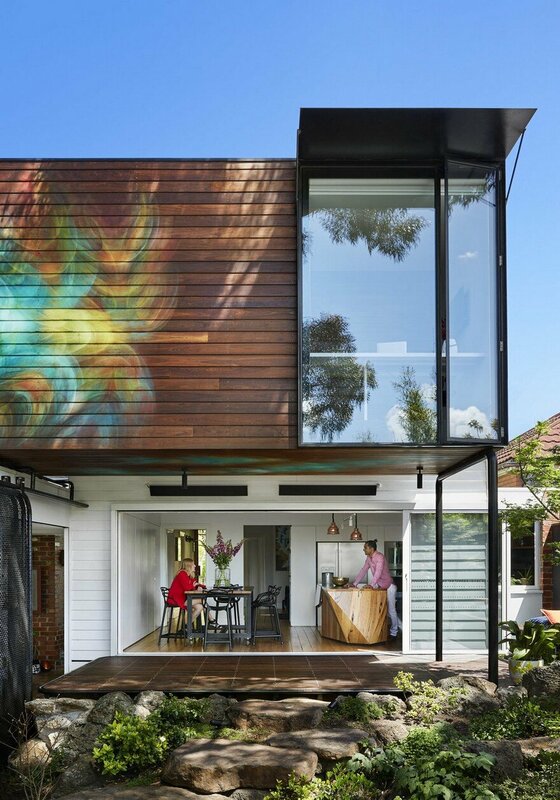 They wanted a light and airy house, with a “strong and positive vibe”, to entertain friends and family and also to relax and meditate. Influenced by Japanese gardens and the Buddhist retreats of Kyoto, the design responds to the client’s desire for peace and mindfulness. A bedroom can be far more than just a dark space at the quiet end of your home. A bedroom can be a contemplative, meditative space that at one time is wrapped up cosy and tight in layers of beautiful heavy curtains and then open to the outdoors the next. 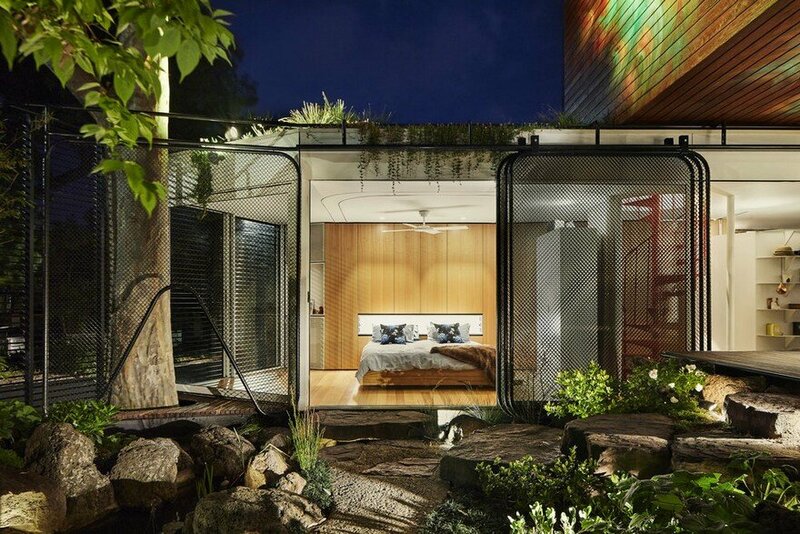 At Kiah House we were charged with the task of creating spaces, both private and shared, that spill out into the garden and yet adaptable enough to create solitude and privacy when needed. 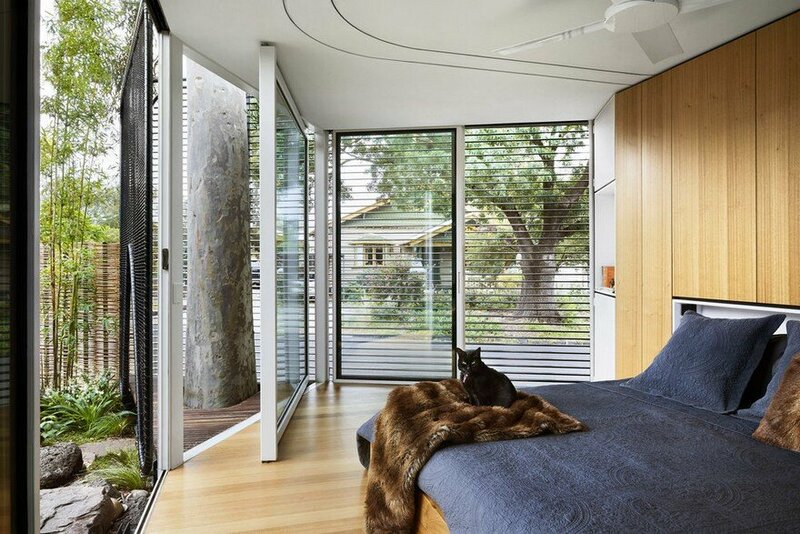 The master bedroom ‘haven’ has a dedicated Buddhist prayer space and opens up to the garden and ponds via sliding double-glazed glass panels blurring the lines between inside and outside. 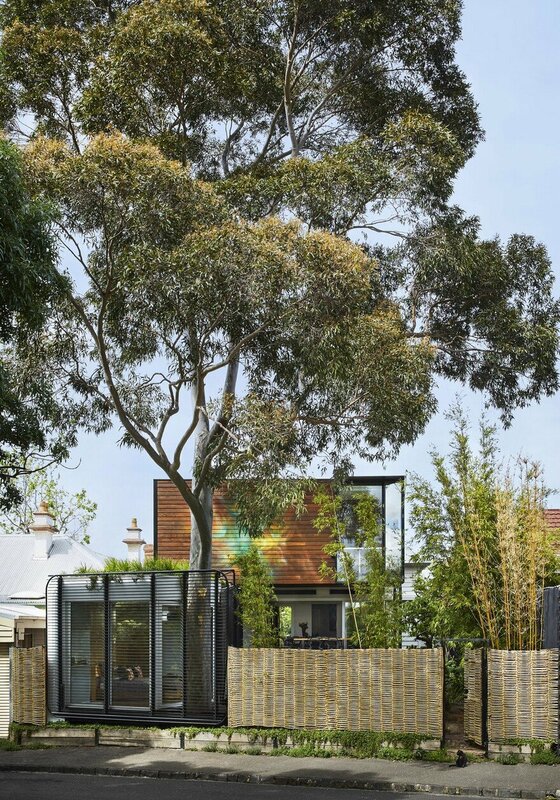 The towering lemon scented gum tree is enclosed by a small deck area, a place for the owners to “sit and meditate”. Kiah challenges the suburban binary of the ‘front yard’ and the ‘backyard’. In this small enclave of North Fitzroy, an unusual road lay-out has led to some houses having two street frontages at either end of the block (see diagram). At the rear of Kiah, high fences and ugly garage doors dominate the neighbours houses, while across the road, on the northern side, old weatherboard homes form a traditional street front. We found the defensiveness of the rear elevations to be odd. We decided that the backyard should be a second front yard. Kiah house engages with the northern street and the northern neighbours. 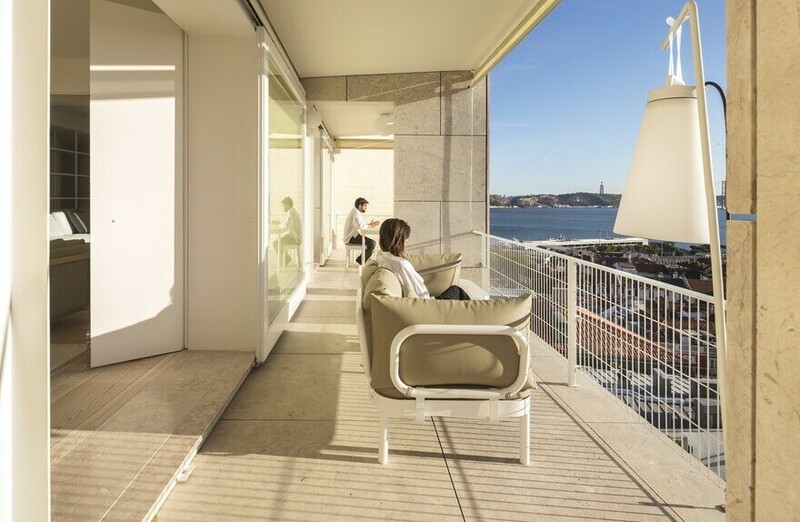 The new deck is elevated enabling views and interaction with the street. 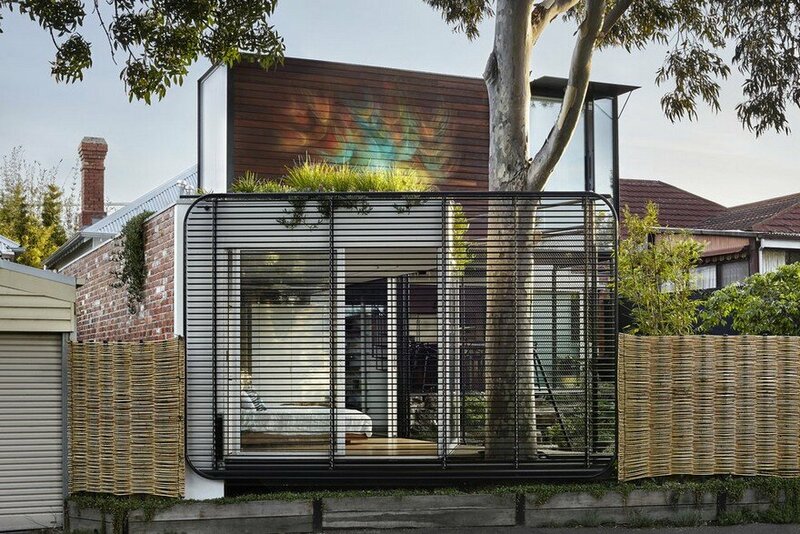 The new bedroom retreat faces directly onto the street, with operable louvres that allow Rahul and Angela to connect as much, or as little, as they wish. 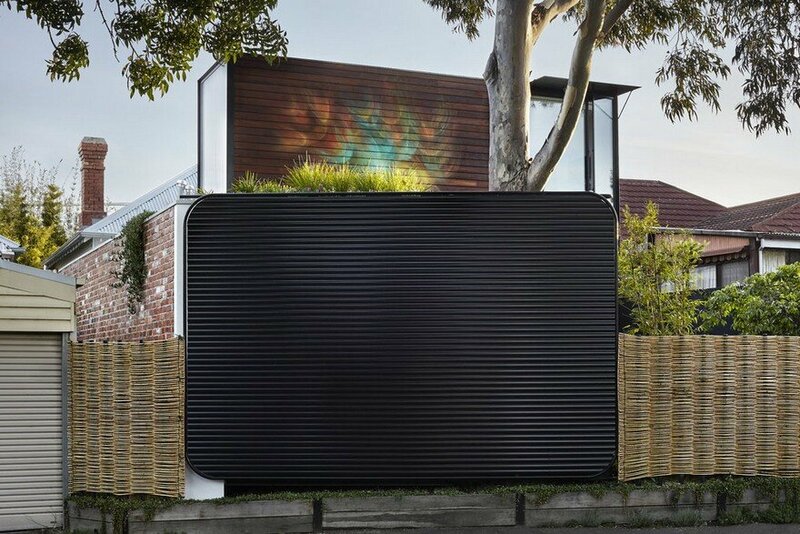 The new bamboo fence allows view and light between the garden and the street. A pedestrian gate creates a new ‘front door’ to the northern street where previously a high and defensive fence turned its back. At Austin Maynard Architects we are interested in the rapidly changing nature of work. The number of employed Australians who work from home has dramatically increased to over 30% of the entire labour force. 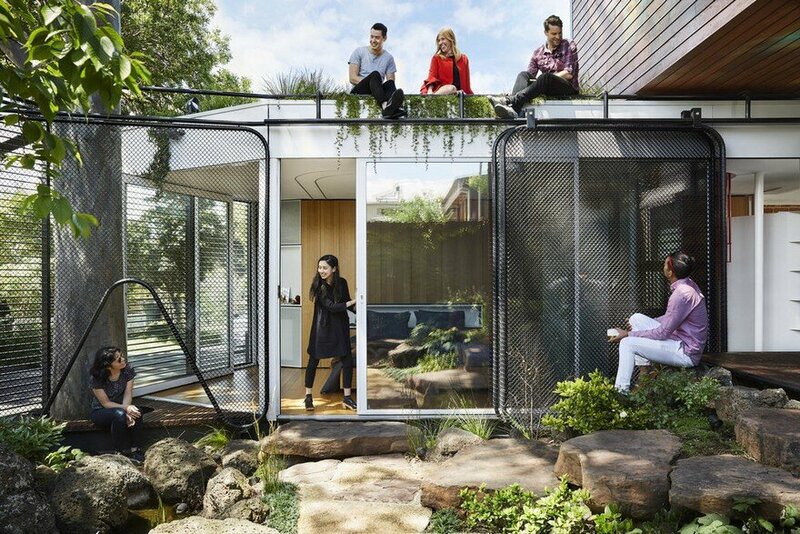 Today roughly 3.5 million employed Australians work from home on a regular basis. The kitchen table or an awkward corner of the lounge is not a productive or feasible way for many Australians to get work done at home. A dedicated workspace is required. But does this mean that we need to dedicate a spare bedroom to office space? And how do we create a clear separation between work and life? How do we isolate or escape the stresses of work if it has a permanent presence in our homes? Rahul is a film maker who enjoys working from home. Rather than opt for a study nook or a converted shed in the back garden, he asked for a dedicated place to work in each day. 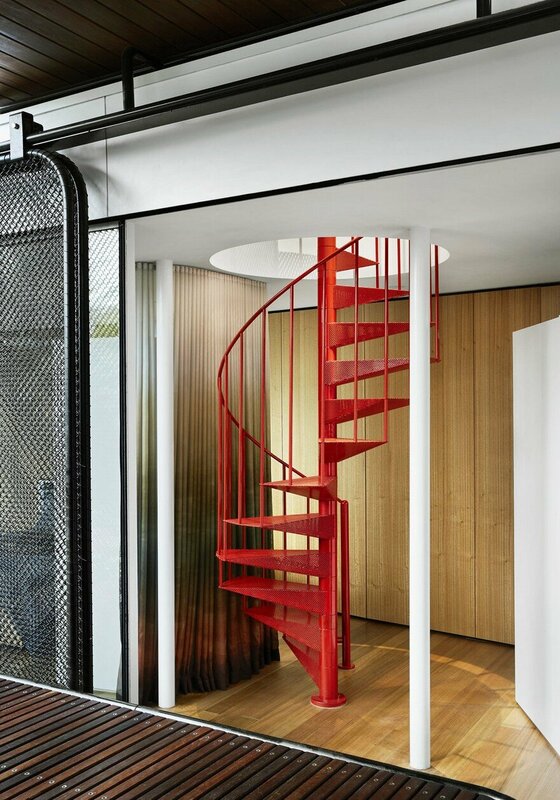 Elevated above the original house and accessed via a spiral staircase, Rahul’s office provides a very different spacial experience to the rest of the house. The office sits above the deck, up in the canopy of the gum tree, with elevated views of the dense green roof of the master retreat and beyond. The office is long and narrow, lined in timber, with perforated steel shelving. Like all of the newly built spaces, Rahul’s office looks out onto the garden, yet this space is elevated and feels separated and private. 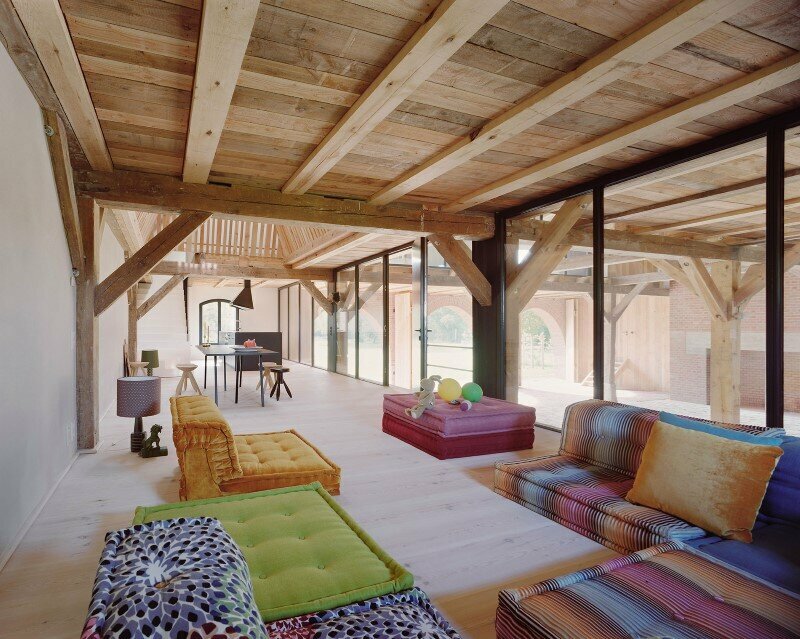 A different space for a different household function. An old towering gum tree dominates the backyard. It has been the wise old elder of the home for decades. Rather than shy away from it or cut it down as some of the neighbours requested, we encircled and embraced the tree, metaphorically and physically. From the retreat you can reach out and touch the beautiful old gum. From the office you are in amongst it, amid the branches and leaves. The bathroom at Kiah house takes you to a different place. The sunken brick bath, big enough for two, has an earthy character similar to the ancient Onsen. A strong connection to a small private garden, created in the gap between the new addition and the old house, offers a relaxed feeling of bathing within the landscape. The bathroom leads up to the kitchen via a secret passage, concealed behind cabinetry. The large island bench is the focus of the kitchen at Kiah house. Angela is a passionate cook who loves spending her free time creating modern gastronomic dishes. 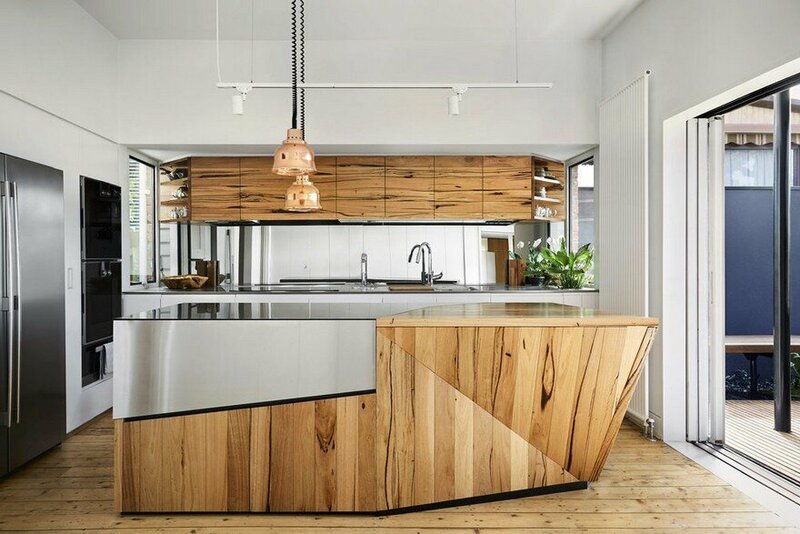 She wanted a high functioning kitchen with double ovens, zip taps, sous vide and custom designed storage space that could be cosy and intimate from day-to-day, yet could also open up for entertaining large gatherings. 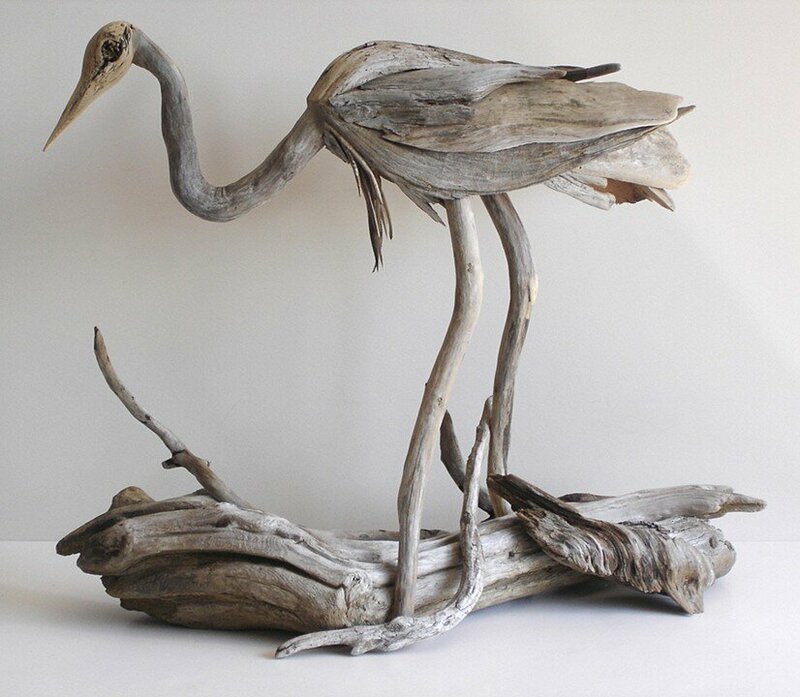 Importantly, this is not a typical island bench, this is a sculptural highly crafted piece of furniture. Half timber bench top, half stainless steel, it is both homely and commercial. The back of the bench top flips up to give extra practical kitchen surface when needed. 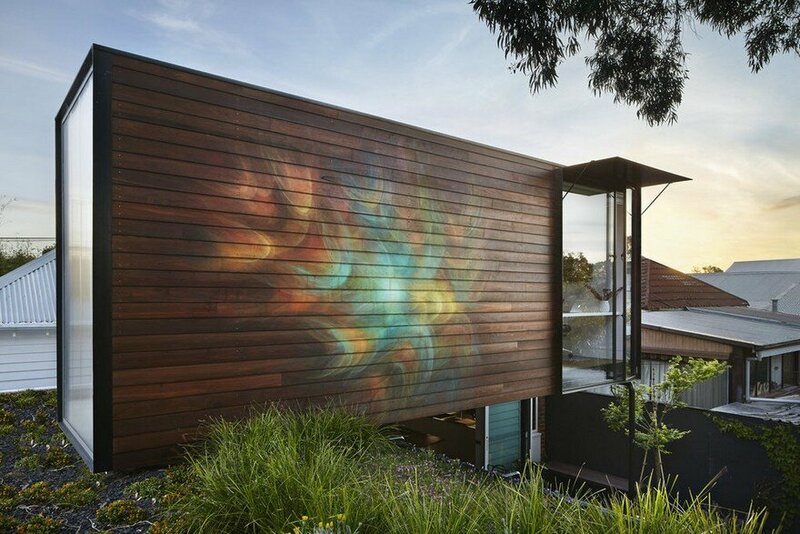 The mural on the side and underneath of the timber lined office is called ‘Awakened Flow’ by Seb Humphreys (aka Order 55). We first worked with Seb at Alfred House, where he painted on an old brick wall with a tall, aggressive, flaming mural. The mural at Kiah has a very different energy. 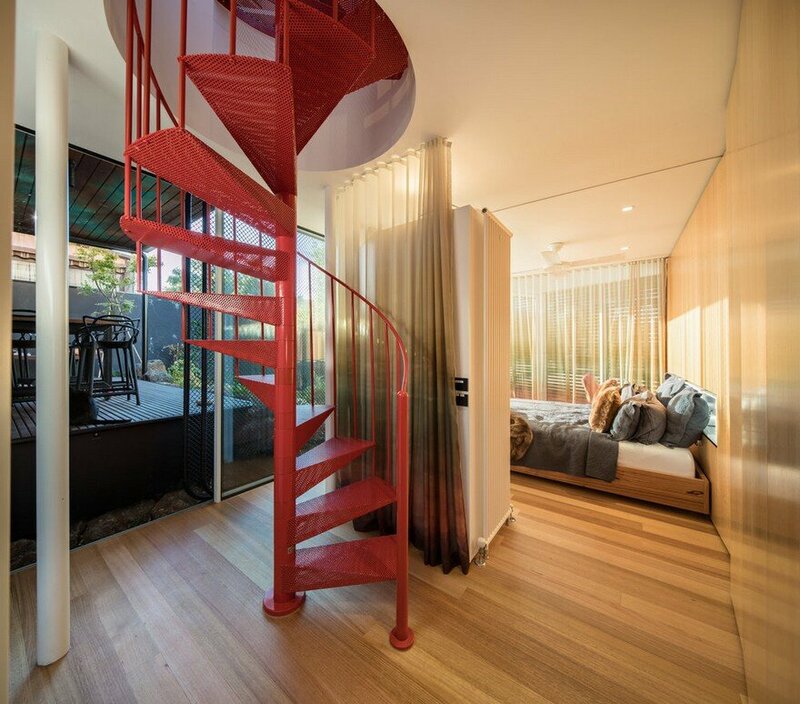 Seb has responded to the rich gardens and the peaceful nature of the home and its occupiers, to create a gentle explosion of colour that contrast beautifully to the spotted gum cladding. 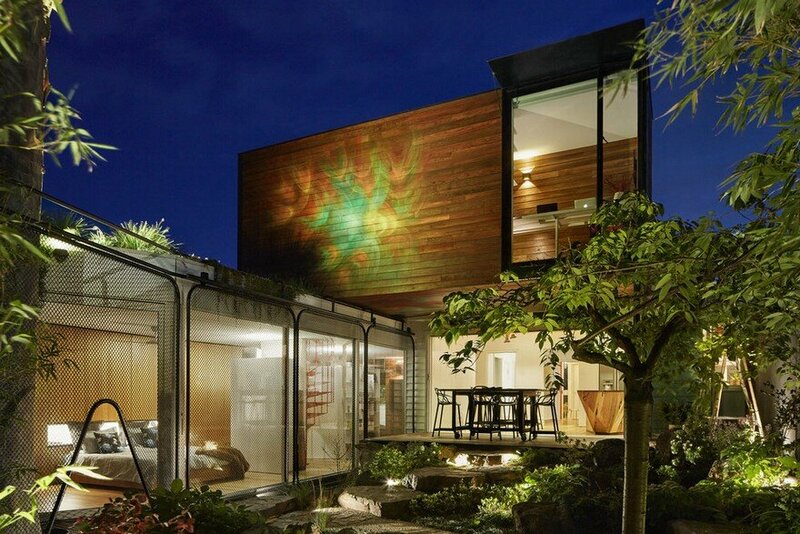 Once a cold uninsulated weatherboard cottage, Kiah House is now a high performing sustainable home. 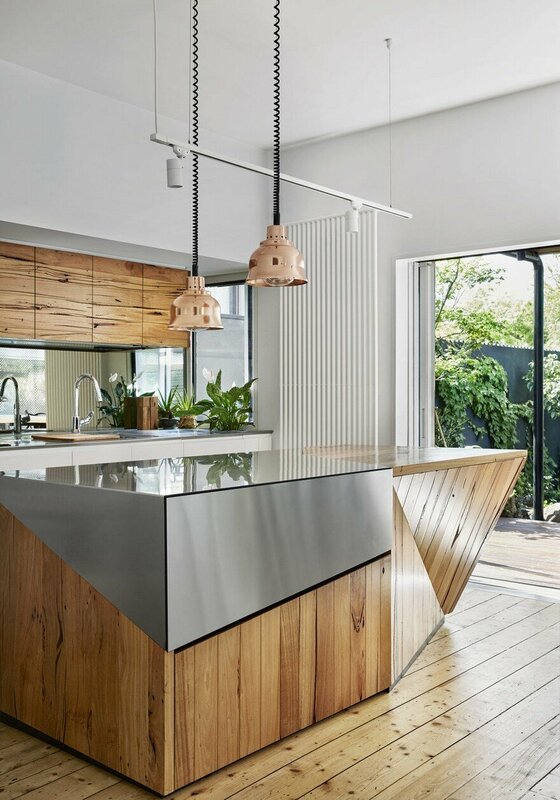 The timber used throughout the kitchen is over 100 years old, salvaged and recycled from the CSR sugar mills in nearby Yarraville. 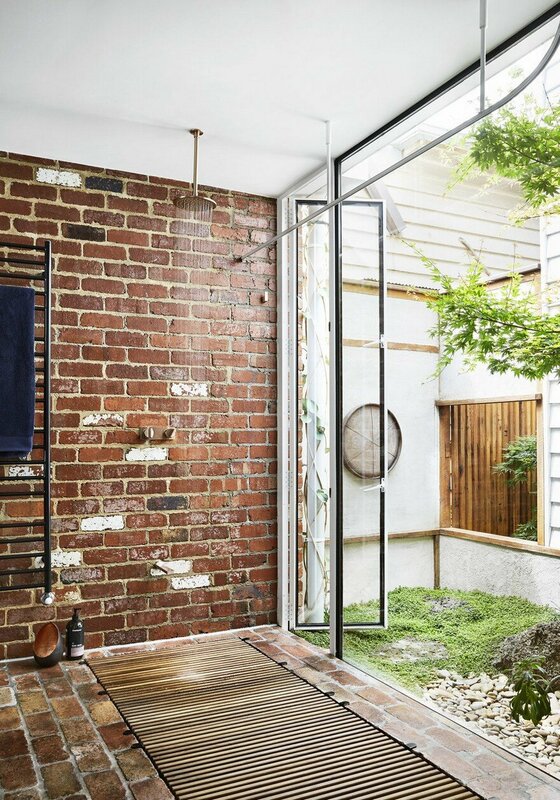 The Red clay bricks in the bathroom were all salvaged and recycled from demolition sites around Victoria, cleaned by hand without the use of chemicals or machinery. 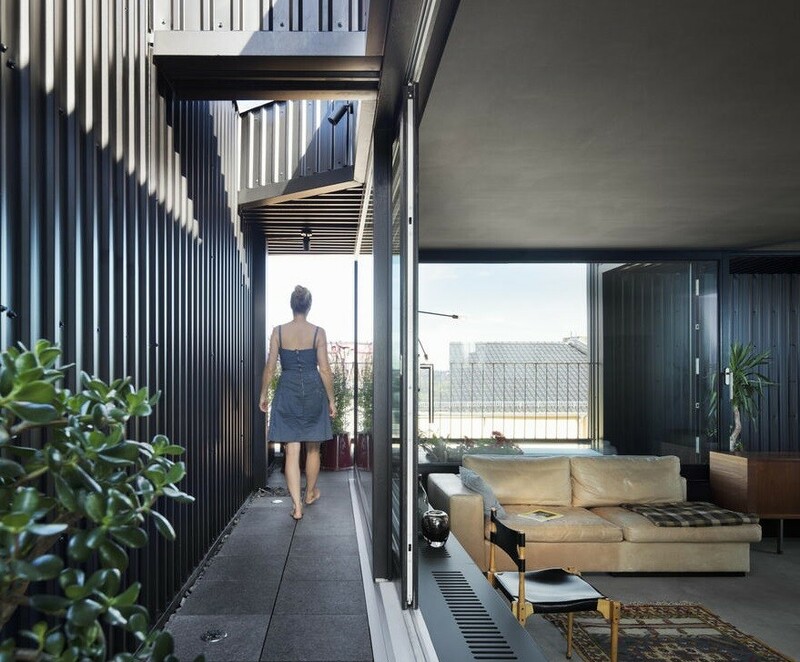 Although the site is small we have maximised natural light and air to all spaces. 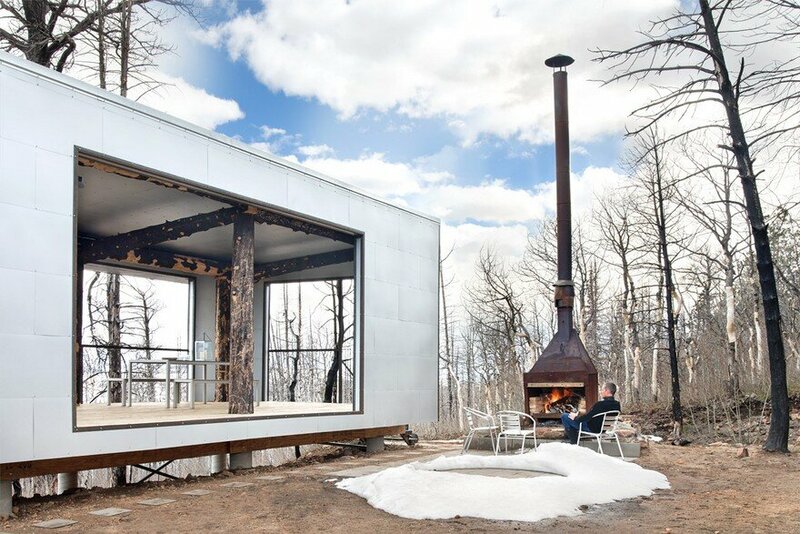 The openings and windows have been designed to optimise passive solar gain, thereby drastically reducing demands on mechanical heating and cooling. All windows are double glazed. 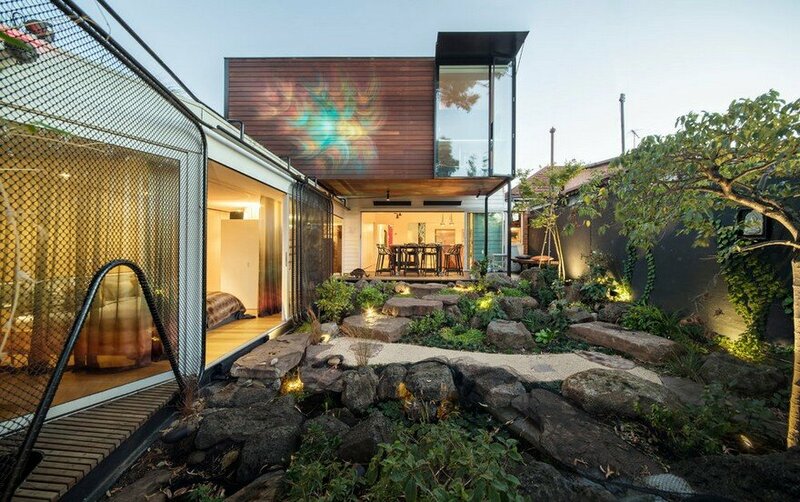 The green roof provides additional insulation, helping to maintain a constant temperature in the bedroom retreat. A large water tank captures roof water and is reused to flush toilets and water the garden. High performance insulation is everywhere, even in the walls of the original house. Where possible we have sourced local trades, materials and fittings. Solar panels with micro-inverters cover the new roof.